I am two steps closer to becoming the walking art gallery I’ve always dreamed of being. 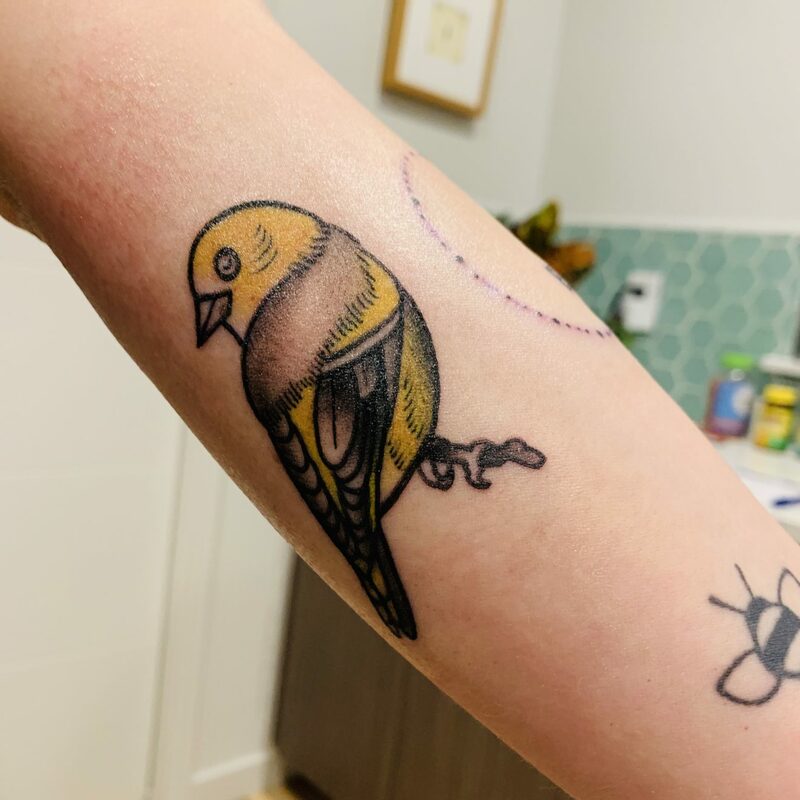 Up first: a bright yellow finch. My finch lives on my left arm in the same spot that my cardinal lives on my right; they represent my grandparents. I would like to figure out how to get both birds in a single picture, but their inner-arm placement is awkward to photograph without me flapping my arms like a circus seal. 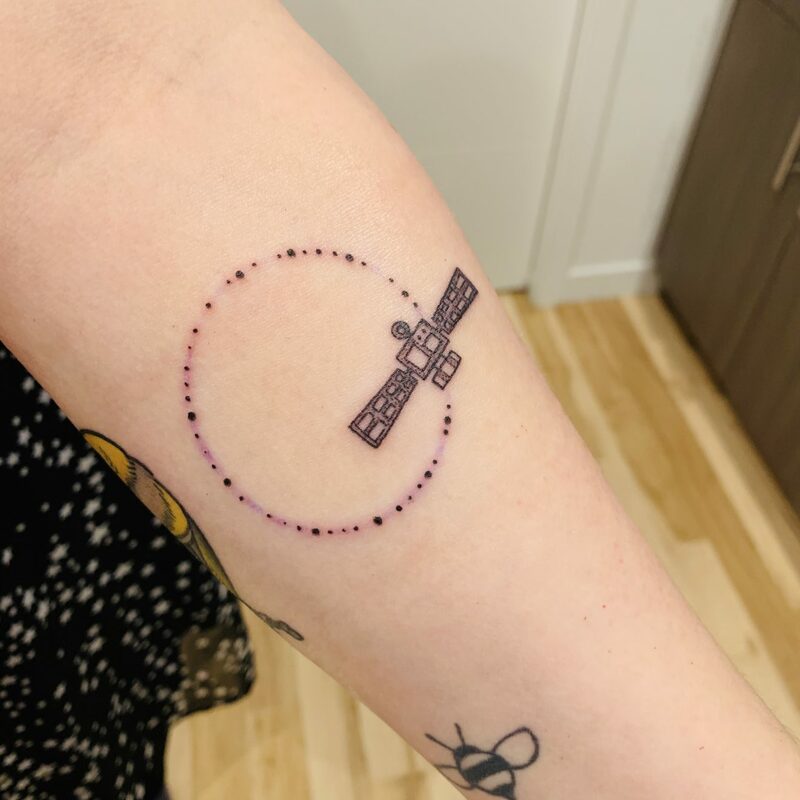 I had a second design applied in the same session: a satellite, inspired by my brother Ryan. Ryan has been a space and aeronautics nut since he was a child, and whereas most kids eventually shrug off their aspirations of being an astronaut, my brother never quite did. Ryan and I used to say that we kept each other well-rounded: I’m why he knows Shakespeare, he’s why I know Alan Shepard and Laika. The light purple line of the “orbit” will disappear; it’s from a particularly stubborn stencil. The dotted line will stay. Just as my left-arm finch is a mirror for the right-arm cardinal, the satellite is a mirror for my ring of lavender. Next up: coloring in my cuckoo clock — or, more likely, giving into one of my 600+ other ideas. P.S. The finch, cardinal, satellite, lavender and clock were designed and applied by the incredible Cambria at Magnetic!